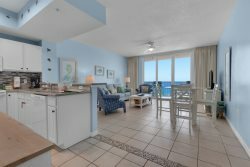 "Rebel's Rest" is a spacious 3 bedroom condo great anyone to enjoy the beach and the amazing aerial view from the 14th floor. An upgraded Kitchen, and modern decor are just 2 of the features of this great unit! The 1st guest bedroom has a Queen bed with its own ensuite bathroom. This room is equipped with a large, Flat Screen TV and DVD player to enjoy your favorite shows or movies. The 2nd guest room features 2 full beds as well as a Flat Screen TV in the room. The master bedroom has a King Bed positioned for a spectacular view of the Gulf of Mexico. The master bathroom has a relaxing Jacuzzi tub and walk-in shower. Enjoy a nice cold drink while taking in the beautiful warm weather of Florida on your wrap around balcony which faces the Gulf. Book today and relax and reconnect on Navarre Beach! The rental process was easy. Everyone on staff are very friendly. The whole complex is clean and well maintained. We enjoyed a very relaxing time. Team members were friendly, professional, accommodating and very helpful. We loved the property and hope to rent it again next year. No negatives to report. Very little interaction. Check-in only took 5 minutes. Have stayed there twice,both times had emd unit. Love the large balconies. The views are not bad either! Whether I called on the phone (from MI), talked directly or emailed the Service Team was always helpful, answered all questions and made recommendations. Loved every second and every part of our stay. It was amazing for the second time, we stayed there several years ago too.. The Staff was amiable and made us feel welcome. Excellent location, roomy, and an amazing view at a great value. The team members were very nice and willing to help. Our stay was very nice! The guest services team were excellent. We had contact with the team members at the front desk and the maintance team members and they were all very polite, cheerful, courtecious, honest, trustworthy and knowledgeable about what they were doing. The property was great, we stayed in 1405. Everything else was great. Your team is the best I've ever worked with. Excellent customer service. Very easy. Love the email reminders about payment. Nice call from check-in to see if we would make it on time or if they had to leave key in lockbox. Navarre is definitely best kept secret in the area. Peaceful. The check in process was smooth and fast. We were settling in our room within 15 minutes of our arrival at the property! The team member that helped us was knowledgeable and detailed! We have stayed at Summerwind 4 of the last 5 years and we won't stay anywhere else! The one year away when we booked too late taught us that not all properties operate the same! Summerwind is clean and well maintained, luxurious and safe! We never have a problem with the condo, amenities or staff. Everyone is attentive and polite.